Which candidate wants your money most? Tonight I was replying to an email from a friend of mine who wanted to know why I didn’t support Hillary Clinton’s bid for president. That’s a topic for a different post but while looking at each of the candidate’s sites I was struck by something. How important money is to each of them? 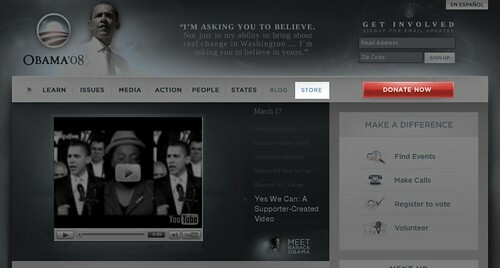 I grabbed a screen shot of the first screen you’d see on each of their sites. 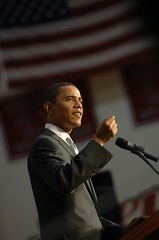 Lets start with Barack Obama, who’s breaking all kinds of fund raising records. A donate button and a store link. 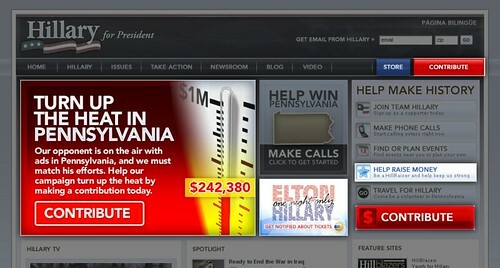 Seems reasonable, especially considering campaigns these days live and die on fund raising. 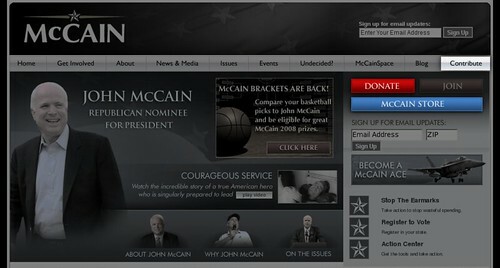 McCain adds a “Contribute” button to his site. Again seems appropriate, especially considering he has his party’s nomination locked up. He won’t need serious cash for a few months now. Wow, it seems that 75% of the first screen you see on her site is dedicated to ways to send her money. This is totally unscientific but I do think it says something about what’s important to them. You make the call.